Orpen and the family holidayed in Howth, north of Dublin Bay between 1909 and 1914. The family would join him after he completed his teaching committment at the Metropolitan School of Art. However on this occasion he seems to want to cut it short. Grace, his wife, has obviously sent him a hefty list of supplies required in anticipation of the family's arrival. Orpen loved to amuse his daughters, Mary, affectionately known as 'Bunny' and Kit, with drawings of animals, which ranged from elephants to bears to chimpanzees to rabbits. However the rabbit seems to be larger than life, rather like the famous 'Harvey' who took the title lead alongside James Stewart in the 1950 film version of Mary Coyle Chase's pulizer prize-winning play. Harvey was a pooka, an animal spirit of Celtic folklore, that, in his case, took the form of a giant white rabbit. Although normally invisible he could be seen by the privileged few if they had the right attitude. 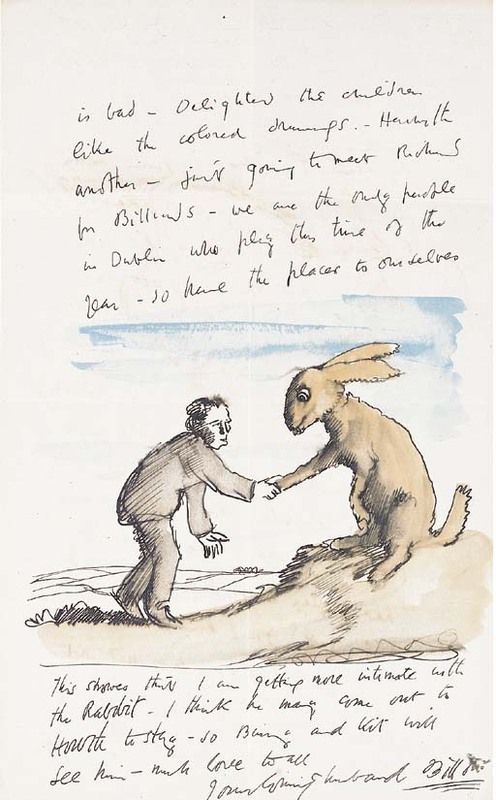 Orpen undoubtedly aware of Irish traditional stories and Celtic folklore may well have created his own pooka which could to be seen by only his children and him, their secret, strengthening the special bond between them. The letter probably dates to about 1911.